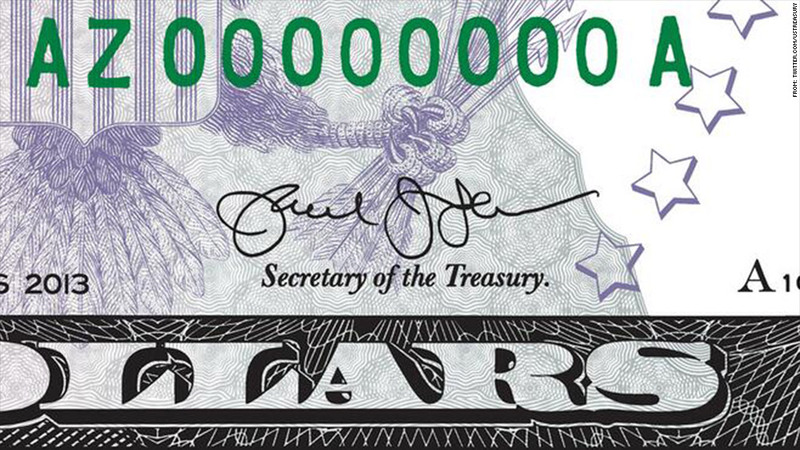 Bills with Treasury Secretary Jack Lew's signature will go into circulation this fall. It's official: Treasury Secretary Jack Lew has undergone a transformation, at least when it comes to penmanship. The Treasury Department on Tuesday unveiled Lew's official new signature, which will soon grace the bottom right corner of every bill in your wallet. Lew's signature needed a major make over. After President Obama nominated him to the post in January, Lew's John Hancock was downright indiscernible. Even the President pleaded for him to work on his penmanship. Lew's signature will first appear on a $5 bill. It will come off the presses this summer and appear in circulation this fall. The Treasury secretary's signature garners a lot of attention, since it is required on each currency note in order to make it legal tender. The process of transferring a secretary's signature onto bills takes 18 weeks, according to a Treasury spokesperson. After receiving signatures from the new secretary and the new treasurer, the bureau creates a series of bills with new serial numbers and suffix letters. A new plate has to be designed before printing the bills. This isn't the first time that a Treasury Secretary had to redo his signature. Former Treasury Secretary Tim Geithner told Marketplace last year that he had to change his signature when he submitted it to the Bureau of Printing and Engraving for currency notes.